Specificité This kit recognizes natural and recombinantHumanIL-12 p35. 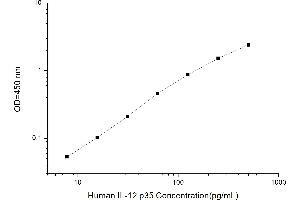 No significant cross-reactivity or interference between HumanIL-12 p35 and analogues was observed. Note: Limited by existing techniques, cross reaction may still exist, as it is impossible for us to complete the cross-reactivity detection between HumanIL-12 p35 and all the analogues. 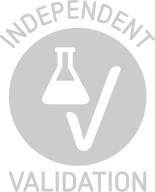 The formulation of the standard is 0.01 M PBS. The standard contains additives (1 % BSA). Reagents include 1 M SO2. Azide, thimerosal, 2-mercaptoethanol (2-ME) or any other poisonous materials are not used. The sensitivity of this assay, or Lower Limit of Detection (LLD) was defined as the lowest protein concentration that could be differentiated from zero. It was determined by adding two standard deviations to the mean optical density value of twenty zero standard replicates and calculating the corresponding concentration. Conseil sur la manipulation All the reagents in the kit should be stored according to the labels on vials. Unused wells should be returned to the foil pouch with the desiccant pack and resealed along entire edge of zip-seal. Substrate Reagent shouldn't be kept at -20 °C (Check!). Exposure of reagents to strong light should be avoided in the process of incubation and storage. All the taps of reagents should be tightened to prevent evaporation and microbial contamination. If not to store reagents according to above suggestions, erroneous results may occur. Stockage commentaire The unopened kit can be stored at 4℃ for 1 month. If the kit is not used within 1 month, store the items separately according to the conditions since the kit is received.